The 2 bedroom apartment sleeps 6 and is in the Four Seasons luxury apartment complex in Ilica near Side on the Turkish Riveria on the Mediterranean coast just 58km from Anatalya international airport which has regular all year round flights from the UK. The apartment has views of the Taurus Mountains and surrounding countryside and is only 5 minutes from the beach resort of Kumkoy, with its lively restaurants, entertainment and and a short car, dolmus or taxi ride to the historic town of Side with its many archaeological interests. 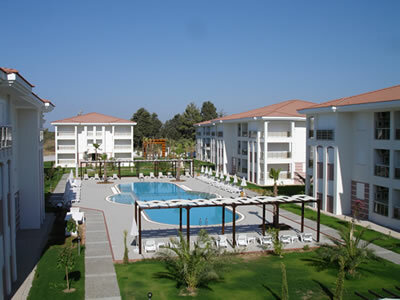 The apartment is also just 20 minutes drive from the many top quality golf courses in the Belek area. The 1 bedroom apartment is on the Nessebar Fort Club complex in Sunny Beach, Bulgaria. The apartment sleeps 4 with 1 double bedroom and a convertible double sofa-bed in the lounge. Nessebar Fort Club is situated in Sunny Beach next to the Aqua Park. It is in the western part of the resort and only a few hundred metres from the sandy beaches. The complex has several swimming pools, cafes, bars and on-site facilities such as crazy golf, tennis court, shops and an internet room. The complex is ideally situated for sight seeing and as its just a few minutes walk to the regular main bus routes that run to local attractions such as Nessebar Old Town and Sveti Vlas you can see the best of the area without needing to hire a car.